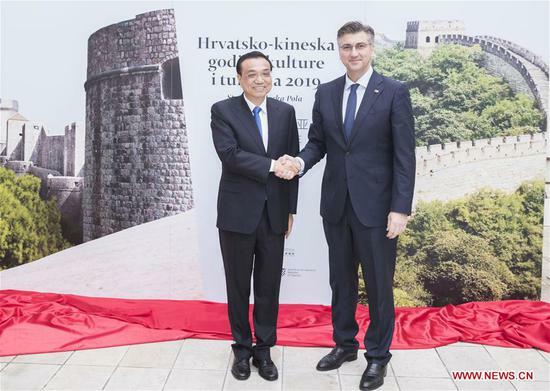 ZAGREB, April 10 (Xinhua) -- Chinese Premier Li Keqiang and Croatian Prime Minister Andrej Plenkovic said Wednesday that the two countries will enhance cultural and tourism cooperation. Li and Plenkovic made the remarks when speaking at the opening ceremony of the Year of Tourism between China and Croatia. Congratulating the two countries on jointly holding such an event for the first time, Li said both China and Croatia enjoy long history and rich and colorful culture, and picturesque natural scenery. The Chinese government supports the two countries' efforts to expand tourism cooperation, said Li, adding that 250,000 Chinese tourists visited Croatia in 2018. The premier hopes that, when conditions are ripe, the two countries can open direct flights in accordance with market and commercial rules to make it easier for people to travel between the two countries. Li said he believes Croatia will attract more and more Chinese tourists, and expects more Croatian people to visit China. On the upcoming leaders' meeting of China and Central and Eastern European Countries in the Croatian seaside city Dubrovnik, Li said he expects to work with leaders of the 16 countries to boost the 16+1 cooperation to higher levels. For his part, Plenkovic said the Croatian people hold friendly feelings toward the Chinese people, and are strongly interested in the rich and colorful Chinese culture and the time-honored Chinese civilization. Calling Li's visit as one of friendship and cooperation, Plenkovic said the Year of Tourism will further deepen the two countries' friendship and bring the two peoples closer. The prime minister said his country is willing to work with China to promote practical cooperation in fields including culture and tourism so as to lift the levels of bilateral cooperation. The two leaders inaugurated the Year of Tourism and saw an exhibition of cultural relics held by China's national museum.